Ming, R. et al. (2015) The pineapple genome and the evolution of CAM photosynthesis. Nature Genetics. Berlin, Konstantin et al. (2015) Assembling large genomes with single-molecule sequencing and locality-sensitive hashing.Nature Biotechnology. Kang, Y. J. et al. (2015) Draft genome sequence of adzuki bean, Vigna angularis. Sci Rep.
Liang Yan. et al. (2015) The Genome of Dendrobium officinale Illuminates the Biology of the Important Traditional Chinese Orchid Herb. Molecular Plant. Liu, X. et al. (2015) Gossypium barbadense genome sequence provides insight into the evolution of extra-long staple fiber and specialized metabolites. Sci Rep.
Luo, Y. J. et al. (2015) The Lingula genome provides insights into brachiopod evolution and the origin of phosphate biomineralization. Nature Communications. Ye, N. et al. (2015) Saccharina genomes provide novel insight into kelp biology. Nature Communications. Chaisson, Mark J P et al. (2015) Resolving the complexity of the human genome using single-molecule sequencing. Nature. Ahola, V. et al. (2014) The Glanville fritillary genome retains an ancient karyotype and reveals selective chromosomal fusions in Lepidoptera. Nature Communications. Ganapathy, G. et al. (2014) High-coverage sequencing and annotated assemblies of the budgerigar genome. GigaScience. Huddleston, John et al. 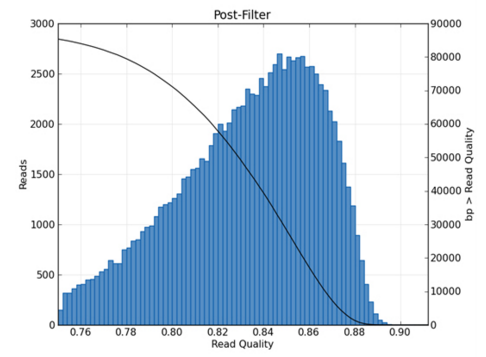 (2014) Reconstructing complex regions of genomes using long-read sequencing technology. Genome Research. Kelley, J. L. et al. (2014) Compact genome of the Antarctic midge is likely an adaptation to an extreme environment. Nature Communications. Kristi E. Kim et al. (2014) Long-read, whole-genome shotgun sequence data for five model organisms. Scientific Data. Xiaofang Jiang et al. (2014) Genome analysis of a major urban malaria vector mosquito, Anopheles stephensi. Genome Biology. Yasukazu Nakamura. et al. (2015) Genome Sequence of a Rubber Tree Hevea brasiliensis: Status 2015. PAG Aisa Singapore. Alistair C. Darby. et al. (2015) The Genome of Plutella xylostella (Diamondback Moth) Three Ways. PAGXIII 2015 San Diego CA. Alvaro Gaitan. et al. (2015) Long-Read Deep Sequencing and Assembly of the Allotetraploid Coffea arabica cv. Caturra and its Maternal Ancestral Diploid species Coffea eugenioides. PAGXIII 2015 San Diego CA. Arun S. Seetharam. et al. (2015) The Teosinte (Zea mays ssp. parviglumis) de novo Genome Assembly. PAGXIII 2015 San Diego CA. C. Neal Stewart Jr. et al. (2015) Draft Genome of Horseweed Illuminates Expansion of Gene Families That Might Endow Herbicide Resistance. PAGXIII 2015 San Diego CA. Geoff Waldbieser. et al. (2015) A Genome Sequence Assembly for Channel Catfish, Ictalurus punctatus. PAGXIII 2015 San Diego CA. Jason R. Miller. et al. (2015) Medicago Genome Assembly with Long-Read and Short-Read Sequencing. PAGXIII 2015 San Diego CA. Jung Sun Kim. et al. (2015) Korean Pear (Pyrus pyrifollia) Genome Sequence using Long Fragment Sequencing on the PacBio RSII Platform. PAG Aisa Singapore. Kirstin Bett. et al. (2015) Len Gen: The International Lentil Genome Sequencing Project. PAGXIII 2015 San Diego CA. Malali Gowda. et al. (2015) Indica Rice Genome Assembly and Annotation using Short and Long Read Sequences. PAG Aisa Singapore, 2015. Maria J. Monteros. et al. (2015) Progress in Sequencing the Genome of Tetraploid Alfalfa (Medicago sativa L.). PAGXIII 2015 San Diego CA. Michel Moser. et al. (2015) Assembly of a Multifunctional Speciation Island in Petunia. PAGXIII 2015 San Diego CA. Michiel de Both. et al. (2015) High Quality Plant Genome Assembly Using PacBio Long Read Whole Genome Sequencing and Short Read Whole Genome Profiling (WGPTM) – Melon. PAGXIII 2015 San Diego CA. Michiel van Eijk (2015) Genome assembly and Iso-Seq transcriptome sequencing of tetraploid cotton. PAGXIII, 2015, San Diego, CA. Mohammed-Amin Madou. et al. (2015) The International Pea Genome Sequencing Project: Sequencing and Assembly Progresses Updates. PAGXIII 2015 San Diego CA. N. K. Singh. et al. (2015) A Draft Genome of the King of Fruit, Mango (Mangifera indica L.). PAGXIII 2015 San Diego CA. Robert VanBuren. et al. 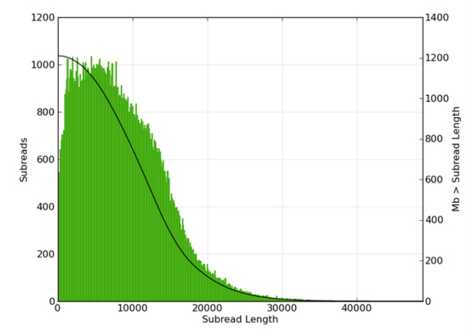 (2015) De novo assembly of a complex panicoid grass genome using ultra-long PacBio reads with P6/C4 chemistry. PAGXIII 2015 San Diego CA. Shubha Vij. et al. 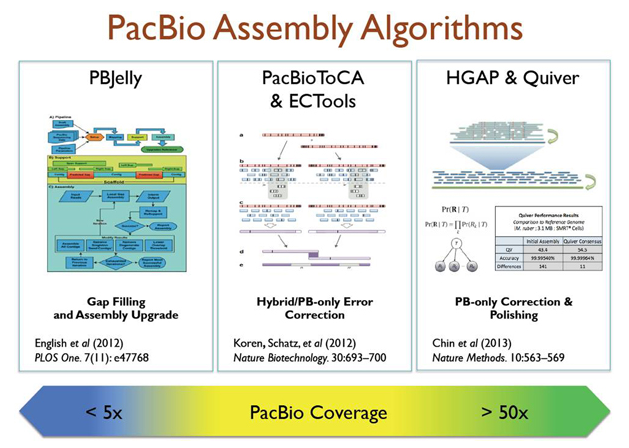 (2015) De novo Assembly of a Medium Sized Eukaryotic Genome Using Pacific Biosciences Single Molecule Real Time Sequencing Technology. PAG Aisa Singapore. Sitaram Rajarama. et al. (2015) Silver Birch - A Model for Tree Genetics. PAGXIII 2015 San Diego CA. Susan R. Strickler. et al. (2015) Genome assembly strategies of the recent polyploid, coffea Arabica. PAGXIII 2015 San Diego CA. Timothy P.L. Smith. et al. (2015) A genome assembly of the domestic goat from 70x coverage of single molecule, real-time sequence. PAGXIII 2015 San Diego CA. Won Cheol Yim. et al. (2015) Transcriptome and Genome Assemblies of the Common Ice Plant, a Halophytic, Facultative Crassulacean Acid Metabolism (CAM) Species. PAGXIII 2015 San Diego CA. Jianhai Xiang. et al. (2014) Advances on Genome Sequencing and Phylogenetic Analysis of Pacific White Shrimp Litopenaeus vannamei. PAG Aisa Singapore. Rajeev Varshney. et al. (2014) Towards developing a reference genome sequence of pearl millet (Pennisetum glaucum L.). PAGXII 2014 San Diego CA. Stephen Byrne. et al. (2014) A Draft Sequence Assembly of the Perennial Ryegrass (Lolium perenne) Genome. PAGXIII 2014 San Diego CA.